Exploring the most important ideas in social psychology, this collection of classic and contemporary readings includes accounts of specific experimental findings as well as more general articles summarizing studies on such topics as attraction and aggression. In the new Eleventh Edition, the most significant and proactive articles of earlier editions have been retained, including such classics as Stanley Milgram on obedience and Solomon Asch on conformity. 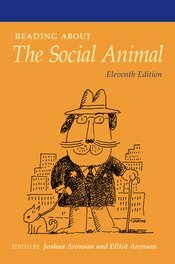 Organized to illustrate the major themes of Elliot Aronson's highly praised book, The Social Animal, this acclaimed collection of articles can readily be adapted for use with any introductory social psychology text or even in lieu of a text.